If your computer supports infrared communication, you may experience some communication problems with the service tool. It is recommended that you disable the infrared option. If you need help with this procedure, please contact the computer manufacturer. The service tool will remain unaffected by Disk Compression and/or Defragmentation programs as long as the compression/defragmentation programs do not move hidden or system files during the process. Administrative rights are required to install CAT Electronic Technician for the first time. Most upgrades do not require administrative rights. 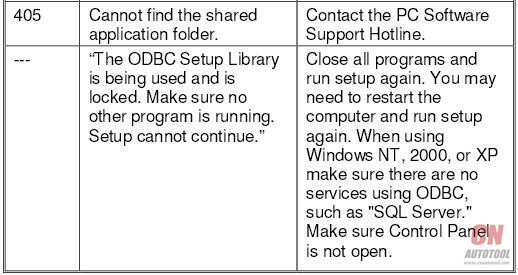 The Windows NT driver appears not to be serving this directory. The CrypKey License service is not started, or the service is not protecting the CAT ET directory. To determine if the CrypKey License service is started, select Services from the Control Panel (in Windows 2000 or XP, select Administrative Tools from the Control Panel), then select services. CrypKey License should appear in the service list. If the CrypKey License service is not started, then the service needs to be started. If it is not there, then re-install the service tool. Note:The user must have administrative rights to add a directory. Run the SETUP_CK.EXE program located in the windows directory (i.e. C:\WINDOWS\ ). Once the CrypKey License service is started, it automatically starts every time the system starts (Any user can then log in and use the CrypKey License service.). 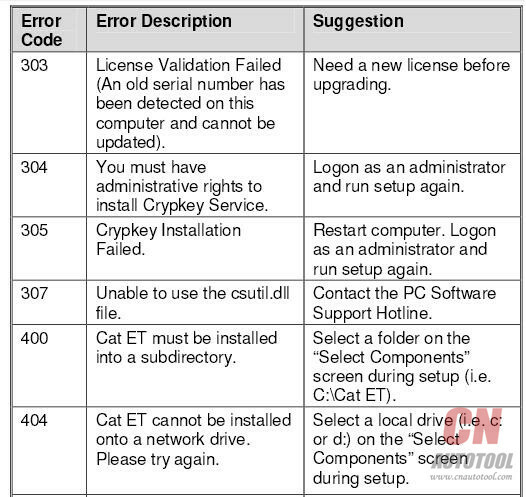 If the CrypKey License service is running and you still get the LIC0102 error code, then the problem may be that the service tool path is not protected. Run the CKCONFIG.EXE program located in the windows directory (i.e. C:\WINDOWS\ ). The service tool directory must be listed in the CrypKey NT Server Configure window. If it is not, it must be added. Press the “Add” pushbutton. The Open dialog box is displayed. Choose ETECH.EXE in the service tool directory (i.e. C:\Program Files\Caterpillar Electronic Technician\), and press “OK.” Press the “Close” pushbutton. If you get an “Internal Error Open SC Manager” failure when the CrypKey NT Server Configure program was closed, you may not have Administrator privileges. Therefore, the CrypKey License server was not updated. box is displayed. Select the Communications tab. Laptops: If you use the built-in pointing device on your laptop PC, your first available port is usually COM 1. Personal Computer (PC): If your PC has a mouse with a round plug, your first available port is usually COM 1. If your PC has a mouse that DOES NOT have a round plug, your first available port is usually COM 2. If your PC DOES NOT have a mouse, your first available port is usually COM 1. Communication Errors Two types of error messages display when communication problems occur. Understanding these messages can help you correct the situation. 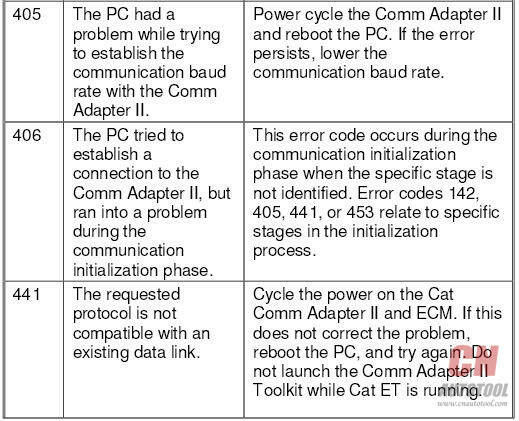 “Unable to Communicate with an ECM!” This is a problem between the communication interface device and the ECM. The PC did detect the communication interface device. Make sure all connections between the communication interface device and the Car Scanner Tool ECM are secure and intact. If the error displays again, verify that you are using the correct cables for your application. ∑ Check all connections between the communication interface device and the ECM. ∑ Verify that you are using the correct cables for your application. ∑ Verify that the ECM has power. 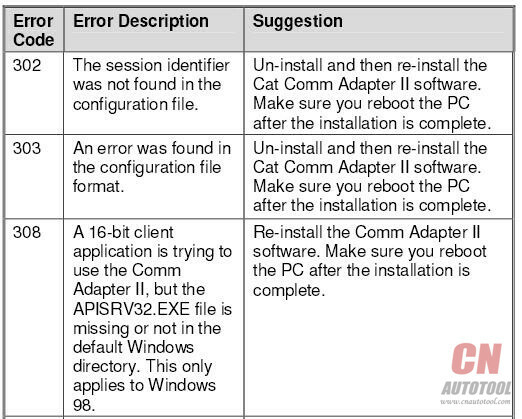 “Unable to Communicate with the Caterpillar Communication Adapter!” This error refers to a problem between the PC and the Communication Adapter. ∑ Check all connections between the PC and the ECM. ∑ Check that the Communication Adapter is receiving external power. The product being serviced must have the key switch on for power, unless it is connected directly to a battery. Communication Interface Device is selected. 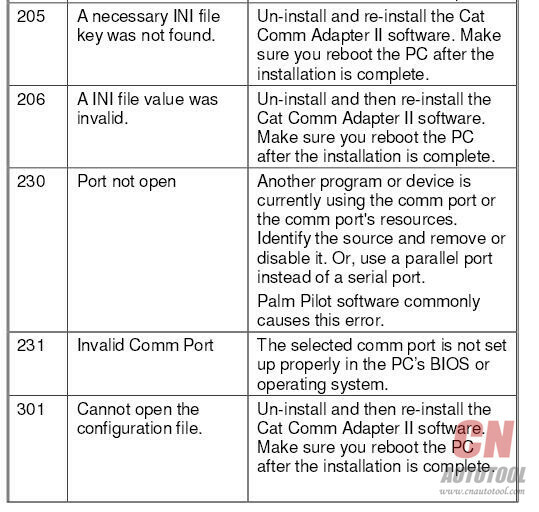 ∑ If using a serial port, verify that your PC Comm Port is set up correctly and is not in use by another device (for example Palm Pilot Software). Try using another Comm Port, if it is available. 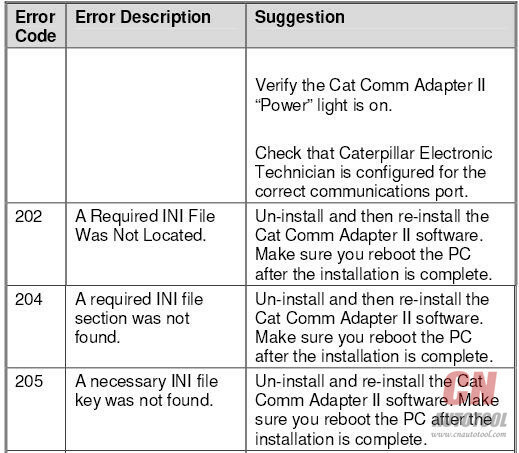 Caterpillar Communication Adapter II Error Codes: When calling for software support, report the error code number to the support staff member. This will aid in solving the communication problem. 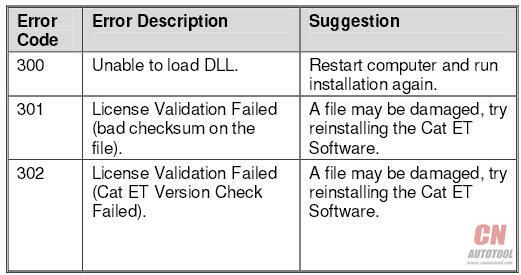 The chart below is a list of error codes and the possible solutions to those errors. *For more information on Error Codes 142, 443, and 453, consult the Comm Adapter II Read Me file located in the Caterpillar Comm Adapter II Group Box (select Caterpillar Comm Adapter II from the Programs menu, then select Read Me from the submenu).